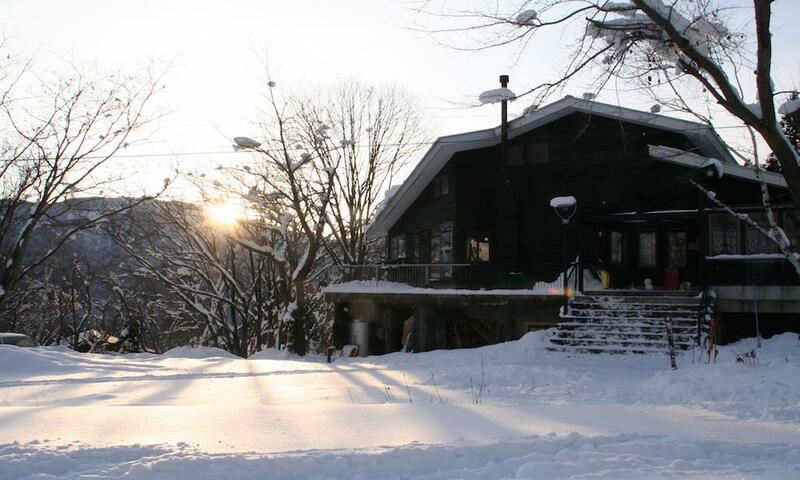 Momiji offers a peaceful and homey retreat for those seeking a unique experience for their Hakuba ski holiday. Momiji is a boutique lodge set in the Northeast end of Hakuba Valley boasting a ski-in ski-out position to Hakuba Norikura resort. Newly open for the 2017-2018 season, Momiji joins the ranks of quality alpine accommodations in the growing Tsugaike, Norikura and Cortina resort region. Momiji invites you to escape the crowd and discover what lays beyond Hakuba’s beaten track. The all-timber build of this inviting, 8-room boutique lodge lends a cozy & charming ambiance and makes Momiji the perfect selection for powderhounds and beginner skiers/snowboarders alike! Momiji is unabashedly positioned in a pristine forest setting right next to the quiet, Norikura resort. Located just 150m away from the slopes of Hakuba-Norikura Satomi, Momiji offers an intimate alpine experience while boasting a virtual ski-in/ski-out access to the ski slopes. With a selection of standard, superior and family style rooms suitable for groups of 1-5 guests, each of Momiji’s 8 rooms have been designed with a simple and functional approach without compromising your everyday modern comforts. The guest rooms are bright and airy and come outfitted with complimentary amenities including broadband WiFi, LCD flatscreen TV with Netflix and Apple TV, individually controlled heating and more. Momiji hotel also features its very own bar & restaurant where guests are invited to unwind and enjoy a selection of new-world wines, sake and local ales while taking in the unobstructed views of the snowscape. Lofty ceilings boasting exposed, reclaimed timber beams plus a wood burning stove adds to the welcoming, cabin-esque atmosphere. Hearty and healthy Japanese home-cooked fare showcasing Hakuba’s excellent fresh and local produce are served up in the restaurant. With the friendly owners rendering quality and personable on-site concierge service, all of your Hakuba ski holiday needs will be taken care of at Momiji. Simply relax and make yourself at home at Hakuba Momiji. Momiji is located at the Northeast end of the Hakuba Valley, nestled at the lower slopes of the quiet Hakuba Norikura resort. This peaceful alpine setting is a perfect location for those looking for a true slopeside holiday experience. Momiji has virtual ski-in ski-out access to the Hakuba Norikura Satomi slopes, located less than 2 minutes walk from the property. The perfect location for powderhounds and families alike, who are looking to escape the crowds and experience skiing in Japan in it's purest form. The ski resorts located at the northern end of the Hakuba Valley - Tsugaike, Hakuba Norikura and Hakuba Cortina - are fast gaining attention thanks to their huge snowfalls, superior snow conditions and quieter slopes. Hakuba Norikura features excellent wide open beginner slopes, perfect for first-time skiers/snowboarders and families. Intermediate skiers and snowboarders will love exploring the quiet slopes, when on some days it truly feels like you have the entire mountain all to yourself. For those seeking the ultimate Japan powder experience, Hakuba Norikura boasts open bowls of deep powder and adjoining lifts with the incredible Hakuba Cortina resort, giving access to Hakuba's deepest snow and best off-piste terrain. Complimentary pick-up and drop-off at all Hakuba area bus and rail stations are provided upon arrival and departure. If you want to explore Hakuba's other many ski areas, the wonderful hosts at Momiji provide complimentary early morning and afternoon rides to and from the resort shuttle bus stop located 400m away. In addition, early morning shuttles are provided directly to the slopes of Hakuba Cortina resort next door, so you can ensure to beat the crowds and get first tracks at Hakuba's most famed powder resort! You can also enjoy everything Hakuba village has to offer with ease, with early evening rides into the main Hakuba village for shopping, ATM, restaurants and bars. Late night pick-ups are available too. This location truly provides the best of both worlds - the best and quietest slopes in Hakuba, while still enjoying all of the village amenities, restaurants, onsens and apres ski scene. There are currently no discounts available at Hakuba Momiji.